Though they may not be as esteemed as those in California’s Napa Valley, New York is actually home to its own gorgeous, high-quality wine producers. From the North Fork of Long Island to the Finger Lakes and the Hudson Valley, wine enthusiasts are taking note of what the state’s unique landscape has to offer. Here are the 10 best wineries in New York. 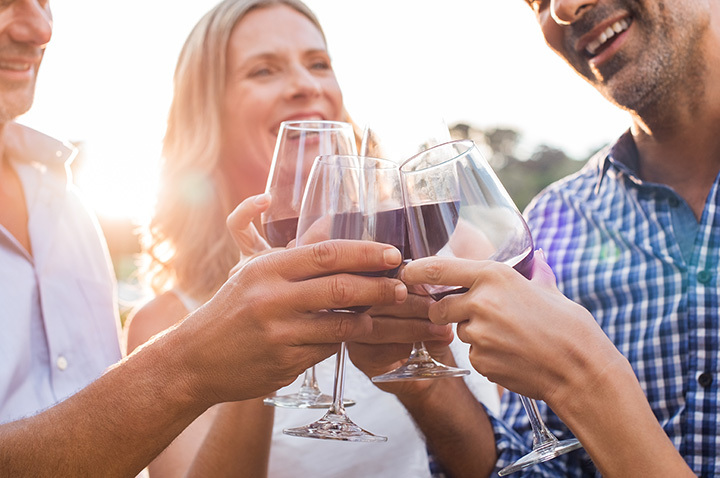 Spread across 130 acres of gorgeous Hudson Valley land, Millbrook Vineyards is a popular destination for wine enthusiasts from as far as Albany and New York City. The vineyard produces European-style wines like cabernet franc, pinot noir, chardonnay, and Riesling. Known as America’s oldest winery, Brotherhood Winery produced its first wine in 1849. The oldest and largest wine cellars in the U.S. are still in use today. Well-known for its spiced holiday wines and meads, the winery now produces cabernet sauvignon, merlot, chardonnay, and other varieties from its Vitis Vinifera grapes. Celebrated for its gorgeous setting in Warwick, New York, this winery makes everything from hard apple cider to popular wine varieties and special fruit liquors. Visitors come for the tasting room, seasonal apple and pear picking, and concerts and events. One of the oldest wineries on Long Island, Wolffer Estate Vineyard encompasses 55 acres of sustainably grown grapes, two East End locations, tasting rooms, and event spaces. The vineyard also puts on free concerts in the summertime. Try the Rosé, the “Summer in a Bottle” varieties, and the hard cider. Situated in the heart of Long Island’s North Fork, Martha Clara Vineyards is open for tastings seven days a week, all year. The large, rustic tasting room welcomes guests in large groups (just be sure you make a reservation). The vineyard’s award-winning wines include the Northville Red and the Chardonnay. Billing itself as an “old-world vineyard,” Raphael Winery’s space has a beautiful, distinctly European feel to it. They offer tours of the vineyard for $65 and tastings on the outdoor terrace or the stunning interior space. Visitors are encouraged to sample the Cabernet Franc and the Merlot. Located on the shore of Seneca Lake, Ventosa Vineyards aims to bring the Tuscan wine experience to the Finger Lakes region. The tasting room is open seven days a week, and there is a tasty café, an entertainment space, and a ballroom for large events on site. Ventos is known for its dry reds, including the pinot noir, the cabernet franc, and the cabernet sauvignon. Opened in 1980, Bedell Cellars is one of the oldest and most prestigious wineries in the North Fork. The tasting room, which sits in a converted potato bard from 1919, is open for tastings seven days a week throughout the year. Committed to natural, sustainable farming, Bedell’s wines are best enjoyed on its breathtaking grounds. Red Hook Winery was started in 2008 with an aim to experiment with creative blends of New York State wines. Though there is no vineyard on site, this Brooklyn winery aims to showcase the best grapes New York State vineyards have to offer, from the Finger Lakes to the North Fork. They invite visitors for tastings every day until 5 p.m.
Paumanok Vineyards opened in 1983 with a focus on producing natural, “old-world” French wines from its early 20th century converted barn on Long Island. Today visitors can taste wines from April to October, sampling everything from the Cabernet Francs to the dry Rieslings. View more New York Wineries & Vineyards.